Penn State student Tim Piazza died after being put through a fraternity hazing ritual. His brother Michael, mother Evelyn and father James hope his death sparks some change on college campuses. Penn State student Timothy Piazza died after being put through a fraternity hazing ritual. His brother Michael, mother Evelyn and father James hope his death sparks some change at the university. Evelyn Piazza wears a heart-shaped pendant around her neck that has Timothy's thumbprint on it. "It's like holding his hand when I rub my finger across the thumbprint. It's him. I'm wearing him," she says. Penn State University's Board of Trustees approved a series of new initiatives Friday that are designed to change how the school's fraternities and sororities are regulated. 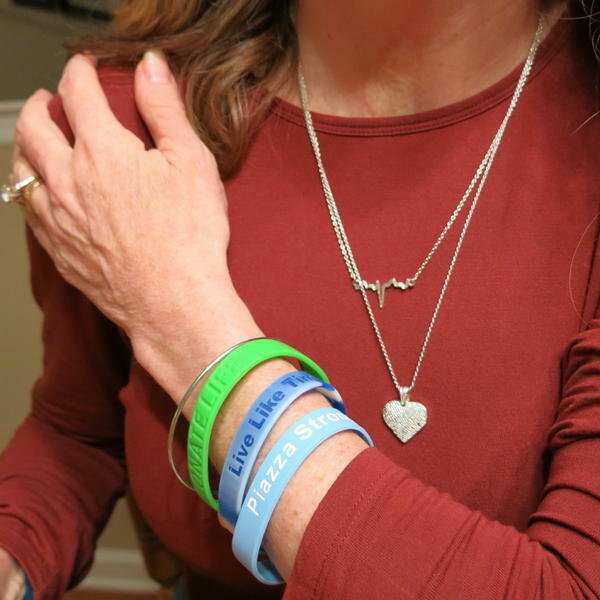 The change comes after the death of 19-year-old sophomore Timothy Piazza brought new attention to the problem of hazing. The most significant move is that Penn State will take over the monitoring and disciplinary processes currently run by student organizations. In announcing the changes, Penn State President Eric Barron said the university will encourage other schools to crack down on hazing, too. "We intend to take a national leadership role in this, and as a matter of fact, I will introduce to the Big Ten this weekend that we organize a national conference on Greek life," said Barron. Barron also said Penn State will urge state lawmakers to strengthen penalties for hazing. 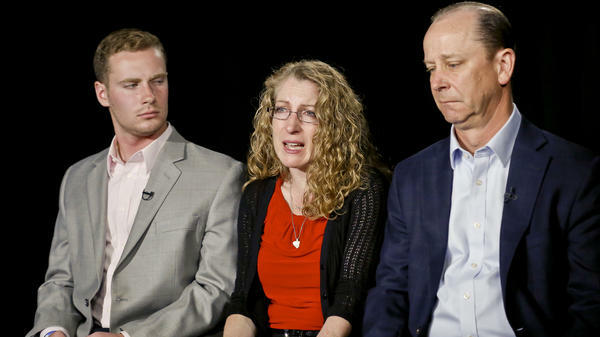 Piazza's parents, Evelyn and James, have not seen the video that captured the events before their son's death but have said they hoped the "horror" he experienced would prompt change at Penn State and lead to stricter laws more generally around hazing. In February, Piazza wanted to join the Alpha Upsilon Chapter of Beta Theta Pi at Penn State. It was supposed to be a "dry" fraternity, but it clearly was not. Alcohol played a central role in Piazza's death. Surveillance cameras captured much of what happened the night of Feb. 2. Centre County District Attorney Stacy Parks Miller says that video evidence was central in a decision to bring dozens of charges against 18 people. Parks Miller says the evening started with something called "the gauntlet." At a May 5 press conference, she described it as a hazing ritual "where they bring the pledges and make them go from station to station and drink copious amounts of alcohol really quickly." Parks Miller says that after that, Piazza fell down a flight of stairs. He was moved to a couch where he stayed for a few hours. But then, Parks Miller says, Piazza stumbled around the house before again falling down the same flight of stairs. "He had injury to his side that was visible," says Parks Miller. "And also people at that point, the presentment will tell you, were pointing to his head." She says that fraternity leaders were aware of Piazza's injuries but that they did little to help him. Court documents show someone put a backpack on Piazza to reduce the risk he would roll over and choke on his own vomit. The prosecutor says one person wanted to call 911, but a fraternity brother pushed him against a wall and stopped him. Parks Miller says that by the time Piazza got medical care the next day, injuries to his brain stem were irreversible. Because of a spleen injury, doctors say, large amounts of blood had pooled in Piazza's abdomen. He was pronounced dead on Feb. 4. Attorneys representing the 18 people charged in the case say the counts filed against them are not warranted. "These charges — involuntary manslaughter, aggravated assault, simple assault — they require an element of intent," says attorney Pete Sala. He is representing his godson Joe Sala and believes this case doesn't clear that legal hurdle. Piazza's parents stood next to the prosecutor at the May press conference. They've read the prosecutor's presentment from cover to cover, but they can't imagine watching the video. "It's bad enough that when I close my eyes, I see him in the hospital," says Evelyn Piazza. "I don't know that I want to see his head hitting a floor, a wall, a railing," she says as her voice breaks up. James Piazza says there is one circumstance that would change his mind about subjecting himself to those images. He would watch it with the Penn State Board of Trustees and Barron. "So that they can see the horror that my son had to deal with that night," and, James Piazza says, so that they will know that serious changes are needed in how Penn State's fraternities and sororities are governed. In addition to the initiatives announced Friday, Penn State has banned the local chapter of Beta Theta Pi forever, and the school plans to issue report cards on fraternities and sororities so students and parents can learn whether there has been trouble in the past. Beyond Penn State, the Piazzas want laws changed so hazing-related crimes get stiffer penalties. Across the country, laws and penalties vary, says Emily Pualwan of the group HazingPrevention.Org. "The laws are constantly changing, and we advise everyone — parents, students and organizations — to know your laws." Her group offers an interactive map to help those who want to learn more. Pualwan says the video evidence has led to the Piazza case receiving more attention than many other hazing cases. "Our main goal and most important focus is making sure some kind of positive change is effected to ensure that this type of thing never happens again," says Timothy's brother Mike Piazza. The family may end up filing a lawsuit against the university and others. But right now, they're focused on the criminal case. As the Piazzas wait for the trial, they're adjusting to life without their son and brother. Evelyn Piazza wears a heart-shaped pendant around her neck that has Timothy's thumbprint on it. "It's like holding his hand when I rub my finger across the thumbprint. It's him. I'm wearing him," she says. The Piazzas have started a foundation to offer scholarships in Timothy's name. They also want to further one of his passions. If he had lived long enough to earn an engineering degree, Timothy Piazza planned to spend his career making prosthetics for children and veterans. Today Penn State University is expected to announce big changes for its fraternities and sororities, this after 19-year-old fraternity pledge Tim Piazza died of injuries after an alcohol-fueled party back in February. That party was captured on surveillance video. Eighteen people face criminal charges related to the death. NPR's Jeff Brady reports. JEFF BRADY, BYLINE: At Penn State, Beta Theta Pi was supposed to be a dry fraternity. It was not. Alcohol was at the center of sophomore Tim Piazza's death, says Centre County District Attorney Stacy Parks Miller. STACY PARKS MILLER: Right after the gauntlet - which is what they call it where they bring the pledges and make them go from station to station and drink copious amounts of alcohol really quickly - he fell down these steps, which are really long. BRADY: Parks Miller says the video shows Piazza stumbling around for hours and falling down those same stairs a second time. When medical help was finally called the next day, it was too late. Parents Evelyn and Jim Piazza stood next to the prosecutor at a press conference last month, but they can't imagine watching the video prosecutors relied on to bring charges. EVELYN PIAZZA: It's bad enough that when I close my eyes, I see him in the hospital. And that whole night - that's burned into my brain. I don't know that I want to see his head hitting a floor, a wall, a railing. BRADY: She would also see that fraternity leaders were aware of Tim Piazza's injuries. But they did little to help him. The prosecutor says some people on the video were pointing to Piazza's head. Court documents show someone put a backpack on him to reduce the risk he'd roll over and choke on his own vomit. The prosecutor says one person wanted to call 911, but a fraternity brother stopped him. Penn State banned the local chapter of Beta Theta Pi and will issue report cards on other fraternities and sororities, so students and parents can learn if there's been trouble in the past. Tim Piazza's brother Mike, also a Penn State student, wants the school to do more. MIKE PIAZZA: Our main goal and most important focus is making sure that some kind of positive change is effected to ensure that this type of thing never happens again. It's not supposed to happen. It can't happen anymore. BRADY: Penn State President Eric Barron says change is coming and details will be announced this afternoon. 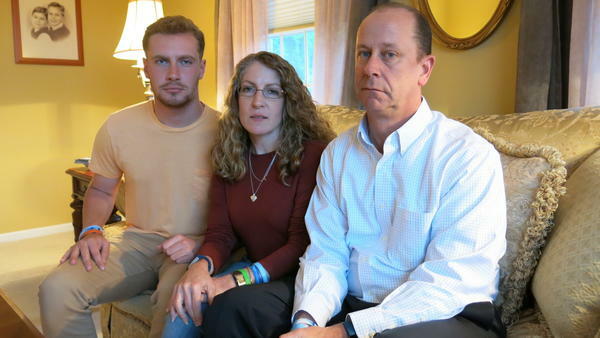 Beyond Penn State, the Piazzas want laws changed so hazing-related crimes get stiffer penalties. The family may end up filing a lawsuit against the university and others. But right now, they're focused on the criminal case. Attorney Pete Sala is representing his godson Joe Sala, who was a member of Beta Theta Pi. PETE SALA: These charges - involuntary manslaughter, aggravated assault, simple assault - they require an element of intent - OK? - and not only that, that you intended for the result, but that the result actually occurred from your actions. BRADY: As the Piazza family waits for the criminal trial, they're adjusting to life without their son. Evelyn Piazza wears a heart-shaped pendant around her neck that has Tim's thumbprint on it. E. PIAZZA: It's like holding his hand when I rub my finger across the thumbprint. It's him. I'm wearing him. BRADY: The family has started a foundation to offer scholarships in Tim's name and to further one of his passions. If he'd lived long enough to earn an engineering degree, he planned to spend his career making prosthetics for children and veterans. Jeff Brady, NPR News, Philadelphia. (SOUNDBITE OF THE AMERICAN DOLLAR'S "TIME") Transcript provided by NPR, Copyright NPR.